THIS is how a crossover event show should be made. The second night of the BIG crossover event features our own Scarlet Speedster, in a game of “who do you trust?” Answer…apparently not Barry…but hang tight folks, there’s a LOT more going on in this episode of THE FLASH! Want to know more? Just follow us after the jump! This entry was posted in Reviews and tagged Arrow, crossover, Dominators, Invasion!, Legends, The Flash on November 30, 2016 by Ed Garrett. Firstly, a warning of upcoming episode spoilers herein. The CW has released the extended trailer and some still images from next week’s episode of The Flash, titled “The Present”. It will be the mid-season finale, and we’ll be seeing more of Jay Garrick as well as some of the season’s major villains. And you can see the stills over at BeautifulBallad.org. There, you’ll see more of Jay (at the Fox Bank, which is undoubtedly named after his co-creator Gardner Fox), and what is probably the Earth-3 Trickster. At the very least, it’s the return of Mark Hamill to the show! Looking forward to the mid-season finale? Glad to see more of Jay Garrick? Share your thoughts! This entry was posted in Media and tagged Flash TV Show 2014 on November 29, 2016 by Lia. The CW has posted the full trailer for next week’s four-series Invasion! crossover. It will air from November 28th to December 1st, and covers Supergirl through to Legends of Tomorrow. So check out the teaser to get a good look at the Dominators and see some DC heroes working together for the first time. Looking forward to anything from the crossover? Share your thoughts! This entry was posted in Media and tagged Arrow, Flash TV Show 2014, Legends of Tomorrow TV Show, Supergirl on November 23, 2016 by Lia. “I’m Wally West, the fastest man alive” is how this issue begins…and exactly how fast is that? Wally has been lost in time for the 10 “lost years” of the New 52. He’s become faster if anything…but now he has the race of all time to run. To save everyone, Wally will have to run faster than he has ever run before. And, with time and relationships not what they were before, the question has to be asked…can he do all of that and stay outside the Speed Force itself? Will Abra Kadabra have his ultimate revenge? For more, follow us after the jump! 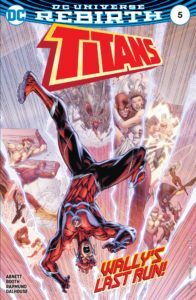 This entry was posted in Reviews and tagged beast boy, DC, Donna Troy, Flash, Lilith, Nightwing, Review, Titans, Wally West on November 23, 2016 by Ed Garrett. Last week we saw the return of the Shade…but the story behind that is more complicated that it may have seemed to be. We learn a lot more about the Shade (and the shadows) this issue. We get more Kid Flash, and…someone turning from friend into enemy! Who might you ask is that, and why? Follow us after the jump! 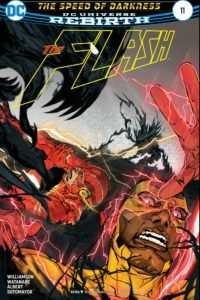 This entry was posted in Reviews and tagged Kid Flash, Review, The Flash, The Shade on November 23, 2016 by Ed Garrett.